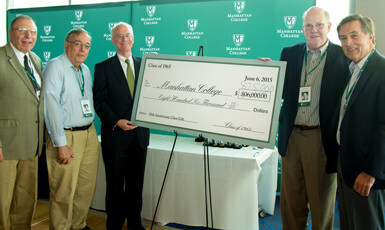 The Anniversary Class Gift is an important part of the College's Annual Fund program. The success of each reunion class campaign is largely dependent upon volunteer committees that establish class campaign goals, identify objectives for fundraising efforts, and increase attendance and participation for Reunion Weekend. We are always seeking new volunteers to reach out to their classmates. Your Anniversary Class Gift helps to enhance and grow student programs and services so students can continue to receive a high-quality education like the one you enjoyed here. We hope you will join us this year by making a gift online today. Or, you can download the gift form and send by mail. If you would like to volunteer your support, please contact Kevin Brewer, Director of Annual Giving, at 718-862-7701 or kevin.brewer@manhattan.edu.